You wake up. 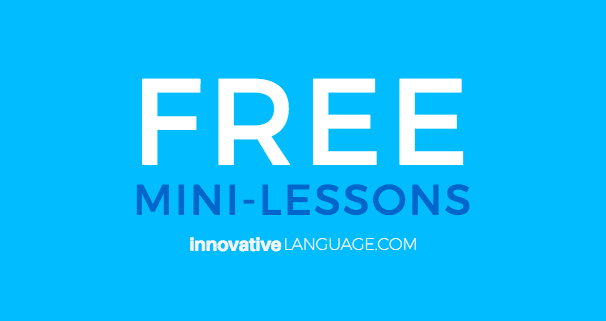 There’s a new free mini-lesson waiting for you. It’ll only take you 1 minute to review. There’ll be a new one tomorrow. And the day after. What kind of sorcery is this!? It’s about our brand new Daily Dose of Language app. It’s completely FREE. The Daily Dose of Language is a calendar that gives you new, 1-minute	lessons every day. Why? Because learning a little every day is easy, strengthens your habits and motivation and you improve your language skills over time. You get a new, different lesson every day. From culture and holidays to grammar, slang, phrases and much more. The goal? So you can easily learn every day, fast – with 1-minute mini lessons. Available in 12 languages now and more coming soon! Preview the NEW Daily Dose of Language Calendar! Click here to get a sneak peak of the Daily Dose of Language Calendar! Suggestopedia is an approach to language acquisition that is communicative. Baroque music is used to set its atmosphere. Pre-session, Session and post session are the three stages of the lesson. Georgi Lozanov is a psychotherapist from Bulgaria who developed this method of learning a new language. Suggestology is what he based this study on and this exact method of teaching has been used in learning different foreign language. This is an unconventional method of teaching new language that Lozanov claim to be much faster for students to learn than other methods. The idea of this method that Lozanov wanted to get across is to lower the affective filter that learners use to adapt to new language. Lozanov claims that his Suggestopedia method liberates the student from anything negatively connected to the language learning process and the influence of the society that they lived in. Students using this method do not feel the pressures associated with learning a second language. Their intelligence is not restricted and they use spontaneity to acquire the knowledge, skills and habits of learning. The suggestopedia method is implemented by focusing on the student’s conscious level of thinking as well as the subconscious, which is the reservoir of the mind. The subconscious mind is unlimited in its capacity to learn and so suggestopedia uses this proven scenario to learn a second language in less amount of time it would take to learn it with other conventional methods. The student is at their best when they combine the three phases that include elaborating, deciphering and memorizing. 1. The deciphering stage is when the teacher initiates grammar and content. 2. The elaborating stage is the practice phase where the student shows what they have learned through song, drama and games. The teacher reads the text with music and sometimes along with the student in the memorizing phase. 3. The memorizing phase is usually called the concert session because it is associated with music. To learn a second language using this method of suggestopedia requires an atmosphere that is comfortable and relaxing. The student learns best when techniques are added to the learning process such as art and music. Suggestopedia is indicative of how the brain works in the scope of learning. The Silent Way was created by Caleb Gattegno and is the instructive approach to teaching a foreign language. The primary objective is for students to work independently as learners of a new language. It allows students to develop their own theoretical models of learning a second language. Students are encouraged to use their mental abilities to decipher the meaning of a new language. Expression of thought and feelings are created in the classroom among fellow students. The student trades their time for experience. The student’s native language gives them leverage in learning a new language and they are given room to learn how to speak in the new language. It is the nonverbal aspect of their native language which includes sounds, gestures and writing that helps the student to identifying with a new language. Gattegno used his model on certain observations and he thought that students did not learn because teachers did not teach. Instead, teachers need to do a study of how students learn and to do that experiment on themselves. Gattegno used himself as an example and even though he was a teacher, he wanted to know how students learned so he became a learner and that is when he realized that awareness is the only thing that teachers can educate when it comes to humans. His learning model claimed to be more approachable to teaching a second language because it was based more on awareness than on offering knowledge to the student. For every learner that Gattegno studied, no matter what age they were, he found one common principle and that is students were gifted and intelligent. They brought a strong will to learn, a lifetime of experiences of managing challenges and they were also independent. Most of the methods of teaching using the Silent Way came from understanding how students learned. Included in this approach was the style of how the teacher corrected the student and how the teacher used silence to validate the student. The teacher wouldn’t give any answers that the student could not find out on their own. A lot of people think that communication is the only tool to learning a new language. However, Gattegno does not seem to think that communication is the only key ingredient. He observed that communication called for the person communicating to convey their ideas and the student listening must be willing to submit to the message before giving a response. Learning a second language is expressing thoughts and feelings, ideas, perceptions and opinions and student can do this effectively with their teacher. They will be able to develop criteria for right and wrong by exploration of the two boundaries. Therefore, it will require making mistakes, which is a part of the learning process. If teachers can study the art of learning and realize that mistakes are good for the learning process, they will appreciate when students do make mistakes. Have you ever stopped to consider how we learn second languages? If you are considering taking up a second language, knowing the process of how we learn can make you a more competent student as well as speeding up the process of learning at the same time. The way in which we learn our second language is different to how we learn our first. As we grow older our cognitive functions develop, giving us better skills to learn new things. As a child we are exposed to our native language, or languages, all of the time, whereas second language acquisition may be limited to just one or two hours a week. Learner External Factors are the ways in which we are exposed to a second language and how we are effected by these outside forces. To better understand how we learn, linguists have studied the different ways we come across information on second languages. Social effects can have a large impact on second language learning. If for example, you come from an Italian background but speak only English, you may encounter a large amount of encouragement in regard to learning Italian from your family and community. Discouragement can also occur, for instance after the September 11 attacks, the number of students studying Arabic dropped dramatically in many western countries due to the stigma attached to the Arabic language and culture after the attacks. Input and intake are terms used within linguistics to describe exposure to language learning and the amount of information retained. Input is information the learner receives about the second language, usually direct exposure to the language itself. For example, if you spent an hour in a class learning Spanish, this would count as input. Intake is the information you remember. Linguists believe in order to maximize intake, input level should be slightly more than the learner is able to take in. Next time you are in a class and don’t quite feel like you understand everything, don’t worry. It’s the best and fastest way to learn. A good way to maximize intake is through interaction with native speakers. This ensures the language us have learnt is usable and also helps to build vocabulary. Pedagogical techniques, or teaching methods, have also bee extensively studied. The way we are taught can drastically change how much we learn. It is believed by many specialists in the field that current techniques are not as effective as they could be.